Today’s card is a bit of an experimental piece. I don’t think I would do it quite the same next time but it turned out ok. I used a stamp positioning tool so I could stamp inside my circle mask and outside my circle mask with different colour schemes. I die cut a circle from frisket film (a removable adhesive backed plastic film) and used both the positive and negative pieces for this card. I positioned the negative piece first on hot pressed watercolour paper then stamped the tree stamp from the PB ‘snow covered’ set in forest moss and chipped sapphire ink. 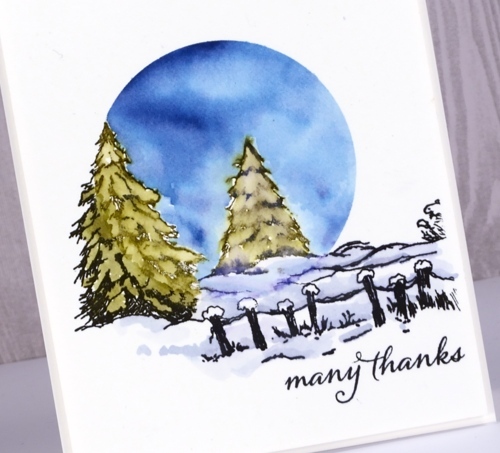 I blended the forest moss ink to fill the tree shapes and the chipped sapphire to colour the snow banks then painted the sky with diluted chipped sapphire ink. I dried the painted area then placed the circle mask over the stamping and removed the negative mask. With the painted section covered I inked the stamp in versafine onyx black ink and stamped the rest of the scene. Basically what was inside the circle was in colour, outside the circle was black, white and grey. I added a sentiment then popped up the panel with some foam. Another beautiful, peaceful card, Heather! wow… genious. I LOVE THAT CARD ! AWESOME! Another Successful experiment I would say! I love this card Heather. How clever to have had the idea of colour inside the circle and black white & grey on the outside and then execute it so beautifully. You make us look at our own stamps in a way that sees beyond the obvious image. That’s the mark of a good teacher. Thanks Heather. Awesome card! Process pictures would help me lot. I am trying to grasp the concept, but it is challenging.